GUYMON, Okla. ?? Hundreds of residents now have power restored after a semi-truck clipped, dragged and pulled several power, cable and phone lines down Tuesday evening. 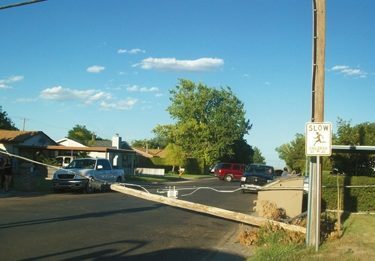 It was just after 7:30 p.m. when a large freight truck driving near Pracht Street and Joyce Drive somehow became hooked to a low-hanging cable line, pulling at least one pole from the ground and dragging more than two blocks of other poles. The cable line shared attachments with Tri-County Electric, PTCI and Allegiance Communications. Officials on scene estimated that more than 20 poles were down. Guymon Fire Department said that upon arrival, they found a semi-truck with power and cable lines over the top of the trailer and large cable poles trailing behind the truck. “This was one of the worst locations for a vehicle to get tangled in cables since there were power lines, cable lines, and phone lines all at this very location,” said Assistant Chief Grant Wadley. Power lines and poles were seen blocking the roadway in the 1000 block of NE 4th near DHS (Dept. of Human Services) while one pole was in full flames behind the Church of God First at 401 N. Pracht. Firefighters answered the call originally as a grass fire. Police tell The Guymon Daily Herald that the driver was making a delivery and was cutting through the residential area to get to Hwy. 54, just two blocks over. It was, in fact, illegal for the semi-truck to be traveling through a residential neighborhood as it is not zoned for tractor-trailors. The driver of the semi-tractor, Craig Lewis was issued three citations, according to Guymon Police. He was cited for inattention to driving, careless driving and a truck route violation. Power was out for nearby residents continuing all the way down Hwy. 54 to the Star Truck Stop, officials on scene said. Those without power were thankful for the quick response as temperatures remained hot throughout the night. Residents gathered together outside at the scene as they realized poles were down throughout the alleys and streets. They described a small “boom” right when the power went out. Cable from Allegiance Communications and cable, internet and phone services provided by PTCI were also affected. “Some lines are still down and our employees are doing everything they can to get everything working again quickly,” said Ron Strecker, CEO of PTCI. Allegiance Communications could not be reached for comment. Guymon Police, Guymon Fire Department, Goodwell Police, Oklahoma Highway Patrol, PTCI, Allegiance Communications, Tri-County Electric and several city departments responded. Damage estimates were not immediately available but are expected to be very high because of all the services affected by the incident, officials said.